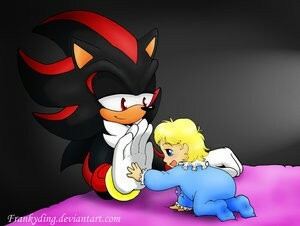 Shadow and baby maria. Shadow with baby maria. Wallpaper and background images in the Shadow The Hedgehog club tagged: shadow the hedgehog shadow the hedgehog. OMG I LOVE SHADMARIA! IT'S SO RARE THOUGHT, BECAUSE OF ROUGE. BUT ROUGE IS FOR KNUCKLES AND MARIA IS FOR SHADOW! One of the very few moments when Shadow smiles. That pic of him and baby Maria breaks mah heart. Translation: oh my gosh! This is do freaking cute that I might pass out of the acuteness overload! wow shadow smiled 4 once! How could you hate Maria? She's so... nice? Is she not? It's both cute and impossible at the same time.